A weathered waterfront Cape cottage gets new life with a restoration that honors the old and welcomes the new. The home’s classic shingled exterior looks much the same, post renovation, with the addition of a multitude of new window boxes filled with pink geraniums. Gold flame honeysuckle climbs the pergola, overlooking the perennial garden’s mix of lavender, salvia, Rozanne geraniums, Bluebonnet, and Asiatic lilies. A new foyer was created to establish a true sense of arrival. Navy grasscloth walls let the white furniture, accessories, and high-gloss white trim pop. A classic barn door was updated with navy high-gloss paint and modern hardware for a polished, but rustic look. 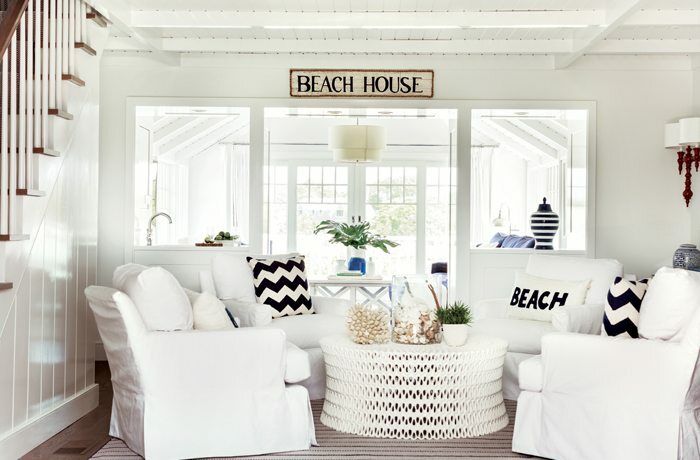 The original entry was transformed into a sitting area, where swivel chairs surround a pierced cast-resin cocktail table, adding a sophisticated touch to the beachy vibe. The cathedral ceiling is painted in high-gloss white to enhance the sense of height and emphasize the simplicity of the beams and trim work. The built-in bench and cabinetry hold summer gear, while teardrop marine cleats are used as coat hooks. The nautical motif was extended to the back deck, where a white, powder-coated aluminum dining set overlooks the Centerville River. The rebuilt deck’s surface was chosen as a close match to the interior floors for a seamless transition between spaces. The clean lines of the bedding and furniture play well against the wallpaper’s whimsical nautical design in the master bedroom. The rope motif of the Lee Jofa wallpaper is echoed in the headboard’s trim and the twisted plaster rods of the chandelier. The designer worked with a sailmaker to create mainsails for headboards in the children’s room. The new owners of this old cottage nestled between Nantucket Sound and the Centerville River had a clear vision. She wanted the retreat to be a haven where their family of five, with three dogs in tow, could relax on weekends. Comfort was key—no worries about wet bathing suits and damp pets on furniture—but she also wanted it to be chic. The renovation, the couple thought, would be relatively easy, as they would be working within the home’s existing 3,500-square-foot footprint. No dramatic alterations were planned to the classic exterior with its weathered shingles. They simply wanted to open up the interior for an informal flow that would welcome more light and water views. They also had a familiar design team on board; architectural designer Jeff Schranghamer and interior designer Nancy Hill had collaborated on the homeowners’ primary residence, and understood the yin and yang of their design mandate—modern yet authentic, classic yet sophisticated. With all those factors going for them, the couple hoped to complete the process in just seven months’ time, so they could start enjoying their summer home on Memorial Day. The interior demolition, however, uncovered major structural deficiencies, the result of a hodgepodge of previous renovations. The house had originally stood as two cottages that had been joined by a common room in the 1940s. Although it had weathered the years and the storms, the structure would need a new roof and some reinforcement to structural walls. Floors were out of level, as well, sometimes by as much as two and a half inches in spans of twelve feet. He opened up walls between the kitchen, din ing room, and common living areas, establishing a visual connection between these spaces and the waterfront views. Windows and doors in the family room and dining room were replaced with French doors, creating an expanded sense of space and easy access to the outdoors. Custom cabinetry solves the dual purpose of offering storage and creating subtle transitions between rooms. Outside, Schranghamer redesigned the decks and rebuilt them with Trex decking in a color that closely matches the interior’s white oak floors for a seamless flow between indoors and out. Each of the six bedrooms continues the ocean theme, often with a bit of whimsy, such as the framed Lilly Pulitzer bikinis on the walls separating two bedrooms, and a colorful fish-themed wallpaper in another. Schranghamer transformed a bunk room into a spacious master suite that spans the second floor, front to back. A private deck overlooks the bay in one direction, while an expanded bank of windows offers ocean views in the opposite direction. Hill extended the white and blue palette to the suite, using a vibrant Lee Jofa wallpaper with a pattern of sailors’ knots on a deep-blue background as a unifying design element. The rope motif is echoed in the trim of the custom headboard and the twisted plaster rods of the chandelier. Sisal carpet in an ocean-gray hue anchors the room. Outside, the owners appreciated the plantings that had matured over generations. They turned to Rebecca Perry, horticulturist and fine gardener, who had also worked with two previous owners, to tweak and maintain them. Perry chose plantings that will thrive in the unforgiving Cape environment and, as she says, “deliver bang for the buck,” with plenty of color. She introduced a hedge of hydrangeas in Endless Summer and Limelight varieties along the road’s edge and placed planters around the house with fountain grass and geraniums. She also added some thirty window boxes to both floors and filled them with cascading blooms—pink geraniums for the front of the house and begonias and blue Streptocarpus in the back. Despite the unexpected challenges the team faced, the homeowners celebrated summer’s kickoff just as they’d hoped. For the design pros, such challenges are all in a day’s work, and they all agreed the process was as fun as it was successful. How do they measure success? Their clients are thrilled with their perfectly imperfect home. It is, just as they wanted, the right blend of old and new, casual and chic, custom and cost-efficient, big, but not over-the-top, and best of all, a joyful home certain to be the source of a lifetime of happy memories. 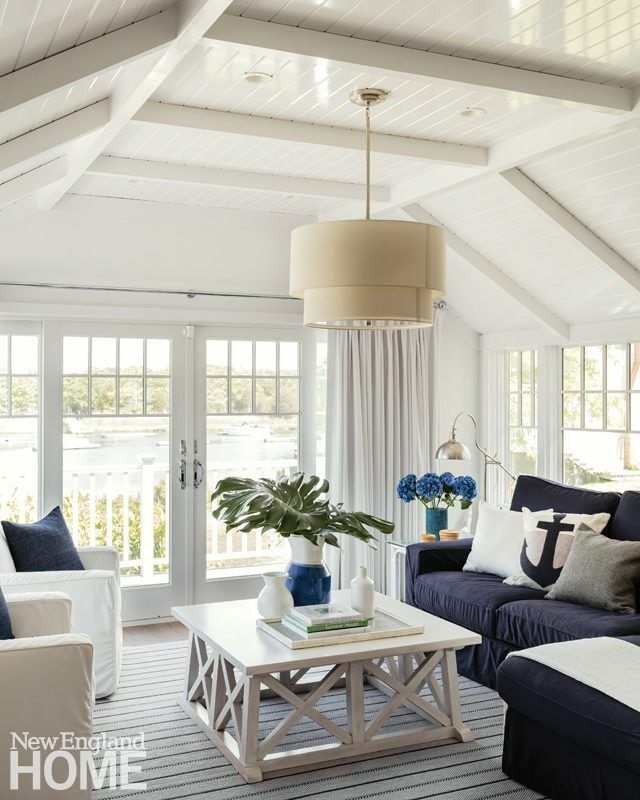 This article originally appeared in the 2017 issue of New England Home Cape & Islands with the headline Cottage Chic.